Sign of the Times… The sign outside of Nashoba High School heralds the arrival of the 2013/2014 school year. 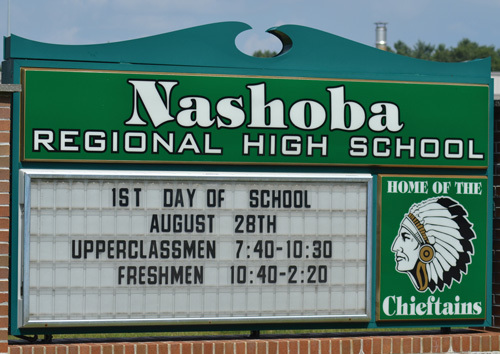 As Nashoba Regional High heads back to school today, many Stow students will be adjusting to a number of changes in personnel and facilities at both Nashoba Regional High School and the central District office. At NRHS, perhaps the most visible new face belongs to Kerry O’Donnell, who has taken over Tracy Calo’s position as assistant principal, announced Principal Dr. Parry Graham. “She is a rock star, she will be wonderful,” Graham enthused. 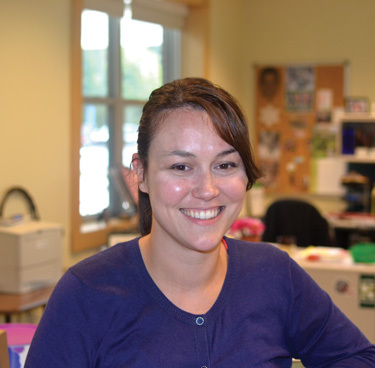 Previously an assistant principal at Gloucester High School, “She works out great, because she has experience with a lot of things we’re going through – NEASC [New England Association of Schools and Colleges re-accreditation], teacher evaluations,” Graham said. Retirements and new positions created mean lots of new staff. Graham was almost breathless when he said, “We really got some amazing people. We’re so excited about every person.” One of the major additions is a third teacher to Fine Arts. Graham stressed this should help NRHS offer more innovative Art courses, and answer the many student requests for more of these classes. Looking at school priorities, when Graham was to meet yesterday with staff, he emphasized he would be stressing the “gottas” and “not-gottas” for the year. Graham explained that the gottas are those items that must get done. The two school-wide gottas are formulating a new teacher evaluation (see below), and preparing for re-accreditation by NEASC in 2015, he said. Though the staff has done a lot of prep work for the evaluation process, Graham noted, this is the official self-study year. Every staff member — not just teachers — is assigned to a NEASC committee. With each committee assigned to address one of the seven standards on which NEASC will measure the school, each must produce a detailed report by fall 2014 on whether NRHS meets the criteria of its assigned standard, Graham said. He added that NEASC will be doing its on-site evaluation in spring 2015. Figuring out long-term space needs also is on the high school’s general to-do list. “Yes, it’s getting tight,” Graham sighed. “We have a fair number of teachers who are travelers — they teach classes in different rooms — because we don’t have the classrooms we need for every teacher.” With an average of four classrooms empty during an average class period, Graham estimated, “We’re at 90% occupancy, tight as a drum.” He noted that creative space solutions — such as splitting a larger Art classroom in two with a curtain — will be the norm for a while. Superintendent Michael Wood agreed with Graham that solving some of the high school’s space constraints will be a top priority this year. Enrollment ticked up at NRHS by almost 30 students over last year’s 1,022, though Wood stressed that history shows that number will drop a bit the first few weeks of school, as a few students change their minds on where to attend school. In personnel changes at the central office, Laura Dwyer has been hired into the new post of Enrichment and Extended Day Coordinator, something planned for in the budget, said Wood. She replaces Linda Caliss, who retired in the spring as head of the district’s Extended Day program, the after-school program at Nashoba’s elementary schools. In the new Enrichment/Extended Day role, Wood explained that Dwyer will still head up Extended Day, but also will work with the school principals to develop enrichment activities. This also will be the year when Nashoba will work on developing a teacher evaluation system. Though Nashoba always has vigorously evaluated its teachers, Wood said the law now calls for evaluating how students are performing in specific areas of a subject under different teachers, and to report findings to the state. “We’ve always taken into account student performance,” Wood stressed. But, with MCAS firmly in place, Wood pointed out, “The difference now, frankly, is we have the data” to more closely analyze performance. Locally, Hale Middle School students and parents will notice a new look to the report card. But, as with fellow middle schoolers throughout the district, Hale students will continue to receive letter grades, rather than be graded against the state standards, as children are now in Nashoba elementary schools, Wood reported.